With E3 rapidly approaching, we stop to reflect on Ubisoft’s press conference from E3 2014 to see how that show turned out with the enlightenment that the year since then has given us. Ubisoft typically floods ever console or peripheral launch with a bunch of titles to take advantage of a new market that craves all of the titles they can get, but this generation was more subdued for them as they only offered Assassin’s Creed IV Black Flag and Just Dance 2014 at the launch with Child of Light and Watch Dogs the spring after. It seemed like Ubisoft overestimated the power of the consoles with the downgrade talk about Watch Dogs showing that their original unveiling was far more ambitious than what we ultimately received and Assassin’s Creed Unity would show the same as another title that has been in the works for a long time before the PS4 and Xbox One existed. They came into E3 with a lineup that had little in the way of surprises, but they knew exactly how to present them with Aisha Tyler as the hostess for another year. Good show. For only having nine games to show during a one-hour show, Ubisoft made a solid showing of the games they had. 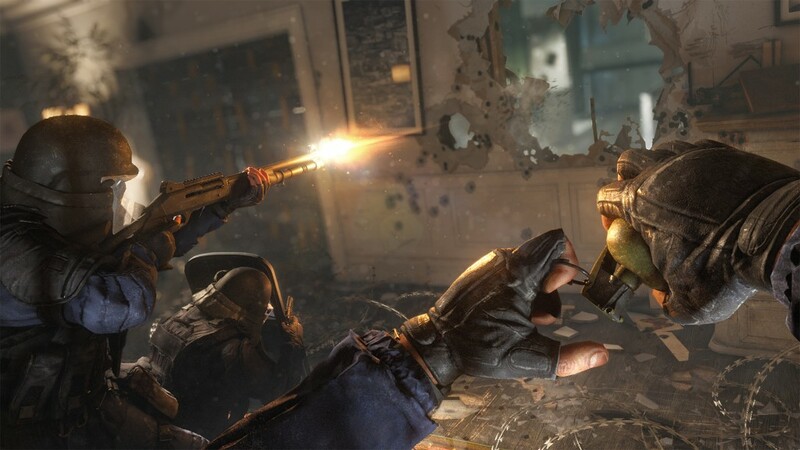 They began with the strong intro of Far Cry 4 and ended with the great closer of a Rainbow Six Siege reveal with a multiplayer demo to send people home. The Division and Valiant Hearts had good trailers to tug at your heart strings while Shape Up provided for the one Kinect demo of any press conference — and it was a good way to present a fitness game. Not everything was perfect, but we’ll get to that later. Rainbow Six Siege. Coming off of the great Rainbow Six Vegas games, it was a sad day when Vegas fans realized that Patriots was not going to happen, so this was the best surprise of the show. Fake Multiplayer Demos. I don’t expect multiplayer demos to be full of cursing and complaining, but the demos for The Division at the Microsoft press conference and the Rainbow Six Siege demo that capped off this show were so perfectly coordinated that it comes off as unrealistic despite being a good way to show us what the best case scenario is for these games. It’s a hard nut to crack, which is why the best route for this sort of showcase tends to be Twitch streams or Youtube videos starring the developers before launch. Lack of 2015/2016 Games. This could be a good or bad thing depending on the person, but only two games were shown with a release date of 2015 or later and one of those games (The Division) has been pushed even further back to make it an easy game to feature at this year’s show. We do come to these press conference to see what the near future has to offer, but we also hope to see some games that are further out to see a broader look at what’s in the pipeline. The bright side is that we’ll have a few more surprises from them at this year’s show if things go according to plan. Broken Games. Ubisoft had one of the big three broken games from the fall of 2014 in Assassin’s Creed Unity and it was a doozy of a broken game that potentially put a black eye on the series. They eventually got the big stuff fixed and cancelled further sales of the season pass while also giving out a bunch of free stuff to those affected, though the game they were left with still seemed to be flawed and didn’t live up to the series’ expectations. They have to make sure that Assassin’s Creed Syndicate doesn’t suffer a similar fate or they can expect the series to start heading downward in terms of sales as people flock from their big moneymaker. Ubisoft made the most of the games they had to offer and didn’t overextend to show some games way early, which lead to a solid, well-produced show. Far Cry 4 was a great way to start the show and Rainbow Six Siege was a great way to end it. It’ll be interesting to see how their lineup looks for this year’s show with just The Division and Rainbow Six Siege returning for another year, as I would not be surprised at Watch Dogs returning with a sequel at the least. Stay tuned for more Hindsight articles coming soon with Sony being next before we finish off with Nintendo as our E3 coverage continues.